Growing up in Britain before the NHS, when one’s health was determined by one’s wealth, and after 1948, when free health care was seen as a cornerstone for a healthy economy and democracy. Under the guidance of the Ministry of Health (MoH), NHS glasses were mass-produced, regulated and robust. The scheme’s focus was firmly on function not on fashion. In 1948, the NHS offered a range of thirty-three33 frames, available in three materials: nickel, gold-filled and cellulose acetate (a type of plastic). It would be another thirty-five years until a completely new design (the 924 ladies frame) was introduced in June 1983. For children the options were almost as limited, but from the 1970s they had the choice of coloured acetate frames in the following hues: ice blue, crystal, flesh, light brown mottle, dark brown mottle and black (ice blue shown in fig.1). One point of difference in the design of the children’s spectacles was that the arms curved inwards and the feet were made to circle around the child’s ears, in a bid to keep the spectacles from sliding off during play. These design features may have prevented the glasses from falling off, but could also make them pinch painfully. From the 1960s, wearers who wanted individuality and could afford to pay, were able to purchase a hybrid version of the NHS spectacles. The hybrids fitted NHS lenses into a private frame. But for many, it wouldn’t be for another 30 years that they would have to find an alternative to NHS spectacles. In 1986, the NHS stopped making glasses in a cost-saving bid and introduced a new voucher scheme. 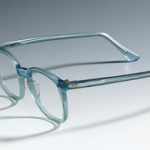 Spanning the period 1948 to 1986, the NHS offered high quality, if not high fashion spectacles and free eye examines. For many people, the cost of glasses had been financially prohibitive, and the scheme offered them their first pair of glasses. Sadly the scheme’s success was part of its downfall, with demand outreaching supply and budgets. As a child who wore NHS glasses, I look back on them with a sense of nostalgia. I recall how they slipped down my nose and bore into the side of my head. It’s now over thirty years since my first pair of ‘flesh coloured’ pink NHS spectacles and it is with some bemusement to see how similar my current specs reflect my first (fig.2). Hi. So glad that you enjoyed my article. Please note a typing error. Gooding ( not Goodall ) Please could you update this on the website? Thank you! Thanks for catching this (and I enjoyed your article very much too)! I have fixed it, but do take a quick look to make sure I have it right.